In the past, women that wanted gorgeous looking tresses would have to sleep on hard, uncomfortable rollers. 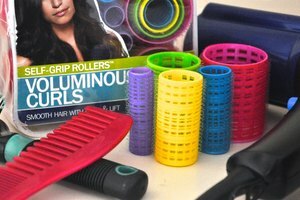 Today, there's the option of using lightweight plastic Velcro rollers to create sizzling new hairstyles. Women that have fine limp hair should consider Velcro rollers because they create volume, bouncy curls and soft waves. Velcro curlers come in many different sizes for different lengths of hair. 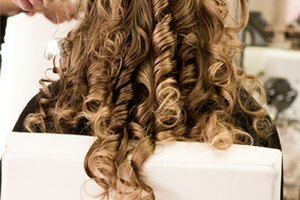 Try experimenting with a variety of curler sizes until you achieve the volume and texture that you desire. Shampoo and condition your hair. It is best to use Velcro rollers when your hair is slightly damp. If you don't have time to wash your hair, use a spray bottle to re-dampen it. Apply a styling aid such as a setting gel or a setting spray to your hair. Consider the size of Velcro rollers that you want to use on your hair sections. Use large rollers for loose waves and smaller rollers for tighter curls. Separate the sections of hair that you will be working with. Pin the section of hair on top of your head from your bangs down to the back of your crown. Pin the sections of hair on each side of your head that is near your ears. Always start with the pieces of hair that are closest to your face and then work your way down to the nape of your neck. Separate a small rectangular section of hair on the top section of your head with a comb. Use one hand to lift this hair section straight out away from your scalp. Comb it so it is smooth and flat. Grasp the Velcro roller with the opposite hand. Place the Velcro roller under the section of hair. Slowly wrap the ends of hair around the barrel of the Velcro roller, making sure that your hair stays smooth. Roll the hair up towards the base of your scalp. Secure the Velcro roller with a bobby pin or a clip. Some rollers are self-attaching so if the roller feels secure, a pin is not necessary. Continue to roll the rest of the top section and then work on the other two sections, until there isn't any loose hair left. 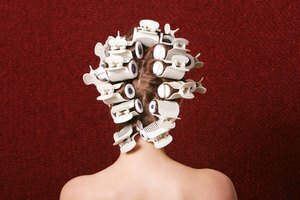 Leave the rollers in until your hair is completely dried. 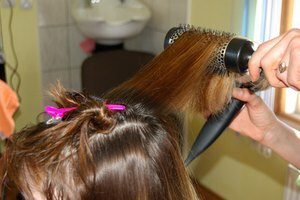 You can blow dry your hair on medium heat for 5 minutes to speed up this process. Allow your hair to cool for 20 minutes before you remove rollers. Unroll the rollers in the same direction that you rolled them. It is best to unroll them slowly and gently to prevent tangles. Avoid pulling straight down because the roller can get stuck in your hair. Use your fingers or a wide tooth comb to style your curls. Add a styling cream to define your new curls.